We are Discovery Channel junkies. More specifically, we are Deadliest Catch junkies. And when I say we are, I clearly mean I am. Me. The hates-to-get-her-hands-dirty, favorite-color-is-pink, chronic-over-hyphenator girly-girl. I don’t watch reality TV but this is really the Coolest. Show. Ever. Because I was so excited about the start of the upcoming season, I decided that I was going to surprise my husband with a lazy weekend brunch, starring King Crab Benedict. What I really wanted to do was make homemade English muffins and this seemed like a good way to improve on our favorite breakfast. Well, you know, that and the King Crab. 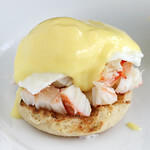 Juicy king crab makes a tasty addition to ordinary Eggs Benedict. Steam the crab legs: Preheat oven to 375. Place the king crab legs in a loose-fitting foil pouch. Before sealing tightly, add a small amount of water. Place in the oven for 10-12 minutes. Using a fork or a crab-leg-meat-getter-outer, remove the meat from the crab legs and place in a small bowl. Gently break up any overly-large pieces with your hands. Toast the English muffins: Use a fork to work your way around, splitting the muffins in half horizontally. (A fork leaves a much nicer, textured landscape than a knife. If that means nothing to you, by all means, go at it with a knife.) Place under the broiler for 1 minute, or until toasty. Make the Hollandaise sauce: In a heatproof bowl set over a pan of simmering water, whisk egg yolks with water, whisking vigorously, until mixture thickens, about 5 minutes. Remove from heat, and stir in lemon juice. Whisk in 1-2 pieces of butter at a time until melted. Season with salt. Serve sauce immediately, or keep warm over the doubler boiler, whisking occasionally and adding 1-2 tsp hot water if the sauce thickens too much. Poach the eggs: Bring a medium pot of salted water to a simmer. Crack the eggs into a small bowl. Using a large spoon, swirl the water in the pot and then gently tip the eggs into the center of the whirlpool. Use a slotted spoon to remove the eggs after about 3 1/2 minutes. Assemble: Build from the bottom up: English muffin, King Crab, poached egg, Hollandaise sauce. Another one of my favorites. I love anything smothered in hollandaise sauce though. Can’t believe you made your own muffins too. Oooh! I’ll have to give this a try! We love watching Deadliest Catch, too! Glad the muffins worked out well for you. I got my DH hooked on Deadliest Catch also. He could not figure out why I would watch it and one day I noticed him paying attention and just about fell out of my chair when he said they were doing it wrong. I then challenged him that he did not watch this show, he rolled his eyes and shushed me. I want one, or two or three! What a treat for the start of the day, or any time of the day really! Happy Easter! Mmmm, I’m drooling over here; I’ve never had shellfish for breakfast, but those pics are making me hungry. Off to the supermarket! Add me as another girly-girl who loves Deadliest Catch. Can’t wait for it to come back on. I printed this out and may try it, but probably without the king crab. You cook the muffins in a pan? Is a “grill pan” one of those flat griddley frying pans with a minimal lip? Hi Wendy – this is the pan that I use. I call it a grill pan, but they call it a Double Burner Griddle. When I saw the photo as the website was loading I actually thought “oh no, she didn’t”. That looks awesome. I’m not a fan of hollandaise but an egg that has a slightly runny yolk over that crab, oo! and cheese, yeah………is it the weekend yet?!!?!? Mmm eggs Benedict with crab, looks delicious! Yum – they look delicious, I love the big chunks of crab on them! We’re big Deadliest Catch fans too! Looks delicious and crab is great any time of day in my book! WOW, that looks amazing!!!!!!! I really must try it!! What a decadently delicious looking breakfast! That would make a great sunday breakfast/brunch. I just saw an item on a menu for a crab cake Benedict and it’s what I had decided upon, after seeing this tonight I know it’s what I’m gonna order! Look’s delish! So decadent: I would love waking up to this breakfast!